This Wednesday evening, at the White Rock Hotel, Hastings Palestine Solidarity Campaign has the privilege of welcoming Dr Khader Abu-Hayyeh, who will tell us his personal story of what the establishment of the State of Israel meant for himself, his family and his community, writes Rachel Lever. On 6 May this year, Israel celebrated its 66th ‘Day of Independence’: the day in 1948 that British colonial rule over Palestine was replaced by Israeli apartheid rule: parallel laws that privilege some according to a made-up set of ethnic definitions, and discriminate against the rest. Many Israelis went to picnic in the Lavi Forest, where they found to their surprise a traffic jam of 25,000 Palestinians headed for the village of Lubya, which, like some 530 other villages ethnically cleansed in 1948, had been demolished and planted over with pine trees to prevent return and to cover up the crime. Only its cemetery is still visible. Just as the villages were covered in greenery, the people who had once been the population of Palestine have for decades been veiled and unseen, referred to as ‘the refugee problem’: no names, no faces, just a mass of sad victims. Naming and meeting some of the people as individuals is as important as signposting the lost villages and houses. Khader was living in his family’s house in Lydda in July 1948 when Moshe Dayan’s Commando Battalion and its recently recruited Stern Gang terrorists swept into the town, leaving “the corpses of Arab men, women and even children strewn about in the wake of the ruthlessly brilliant charge.” A further 80 people, sheltering in the Dahmash Mosque, were machine-gunned to death. Khader’s family were lucky to escape, joining the long hot walk eastwards into Jordan. Today he is a doctor in Tunbridge Wells, active with the West Kent PSC, and has strong ideas for the future of the peoples of Palestine. Come and hear his story and listen to his ideas. It’s a rare chance. 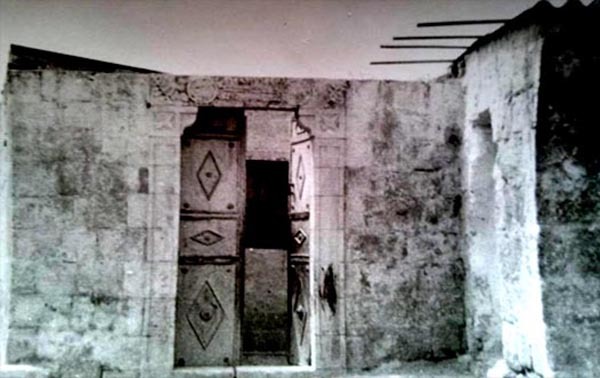 Palestine 1948: the doctor’s story: A personal account by Dr Khader Abu-Hayyeh. 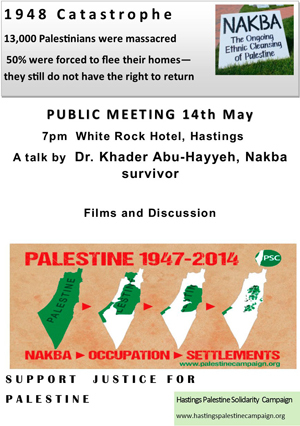 Public meeting of the Hastings Palestine Solidarity Campaign, Wednesday 14 May, 7pm, White Rock Hotel. You can read more on the return to Lubya on this website.